Toronto-based Corus Entertainment reports on their official opening of 'Corus Quay' - the Company's new Canadian headquarters built along Toronto's waterfront. "...Corus Quay integrates advanced digital technologies and automated systems that transform Corus' broadcast and content businesses making Corus Quay North America's most advanced broadcast facility and Toronto's smartest building..."
"Corus Quay gave us the opportunity to transform the operational and technological processes that underpin our business," said John Cassaday, President, CEO, Corus Entertainment. "Our fully integrated digital infrastructure provides Corus with the agility to respond to our customers needs in a changing marketplace. 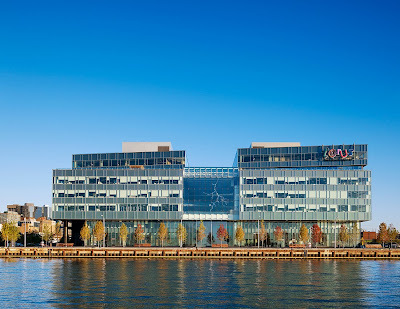 Corus Quay will also allow us to efficiently leverage all future growth opportunities." "With a fully integrated and 100% digital infrastructure, Corus is more prepared than anyone for a digital world because it can deliver content to distributors in any format for any platform with equal speed and efficiency," said Marcos Gonzalez-Flower, Global Head, Media Consulting, Siemens IT Solutions and Services, Inc.
Corus has consolidated its Toronto-based operations from 11 distinct locations, including 24 television services, three Toronto radio stations and over 1,100 employees into one facility, with a configuration allowing up to three times as many services to be delivered from the facility. 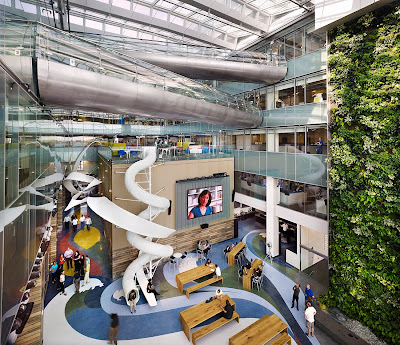 The open concept office space creates a collaborative and innovative work environment, including environmentally advances of a five-storey bio wall for air filtration, a green roof and energy efficient lighting. Corus Quay also uses low-flow water fixtures and re-used rainwater to reduce water consumption. The building is the anchor project in the revitalization of 'East Bayfront', "...bringing life, energy and business opportunities to Toronto's waterfront..."